Most mystery readers have read some Chester Himes, probably Cotton Comes to Harlem. But there are other gems in the Coffin Ed Johnson and Grave Digger Jones saga. One of them is The Big Gold Dream which centers around a large amount of money that leads to the murder of whoever holds it. Coffin Ed and Grave Digger move around Harlem working their stool pigeons trying to get a handle on the nature of these murders as the bodies mount up. A good part of the plot centers around Sweet Prophet’s Temple of Wonderful Prayer. Himes critiques American materialism, religion, race relations, and gender roles. 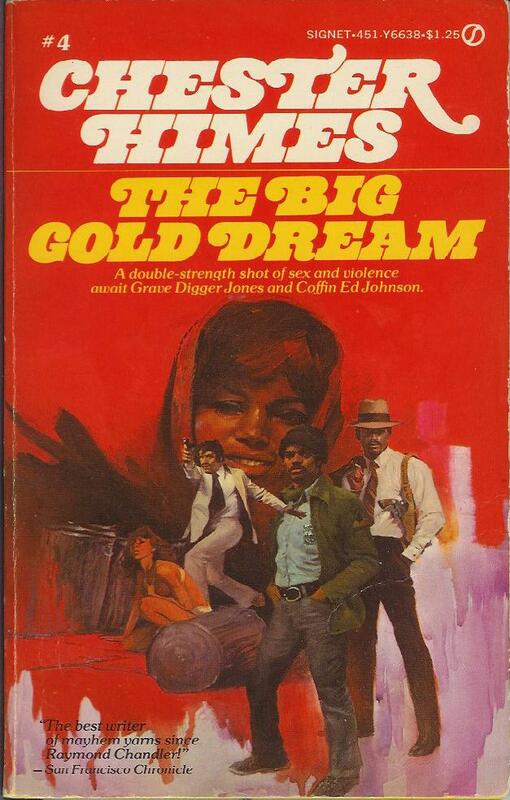 If you’re in the mood for a police procedural with a social consciousness, The Big Gold Dream will fulfill your need. This entry was posted in Uncategorized on April 16, 2010 by george. Part of Megan’s book THE STREET WAS MINE is on Chester Himes but I’ve never read him. Chester Himes’ books read like Ed McBain on crack, Patti. I love Gravedigger and Coffin Ed! Sadly, Gravedigger and Coffin Ed are nearly forgotten, Bill. I like the top left cover the best, but that’s just me. The bottom one certainly has a late 70’s feel to it. Great post, George. I like the top left cover, too, Rick. I wish I could have made it bigger. The bottom cover is typical of the covers the series had in the 1970s. It’s fun to see the progression of cover artwork over time. So many classics of the past are forgotten these days, George. Glad you brought this one back. That’s why I enjoy FORGOTTEN BOOKS so much, Jeff. It gives me a chance to remind readers of great books from the past. Covers through the ages. A treat, George. I don’t come close to presenting anything like the great covers on your blog, Evan, but I try my best.